Heat oven to 350°F. In large bowl, mix cookie mix as directed on pouch, using water and oil. On ungreased large cookie sheet, drop dough by tablespoonfuls about 1 1/2 inches apart. Bake 6 to 8 minutes or just until set. Remove from oven; set oven control to broil. With cookies on cookie sheet, press back of metal tablespoon into center of each cookie to create indentation. Spoon 1 tablespoon marshmallow creme into center of each cookie. Return cookie sheet to oven. Broil 1 to 2 minutes or just until marshmallow creme turns a light golden brown. Remove from oven; cool. In medium glass bowl, place chocolate chips and whipping cream. Fill 1-quart saucepan with water; place glass bowl on top of saucepan. Heat water to boiling. Stir chips and cream until melted. Transfer melted chocolate mixture to large resealable plastic bag; seal bag. Cut off small bottom corner of bag. Drizzle chocolate mixture over toasted marshmallow centers of each cookie. Let stand until chocolate is cool and slightly firm before serving or storing. Watch carefully when you’re broiling the marshmallow creme. It can burn easily. You want the marshmallow to be just toasted. 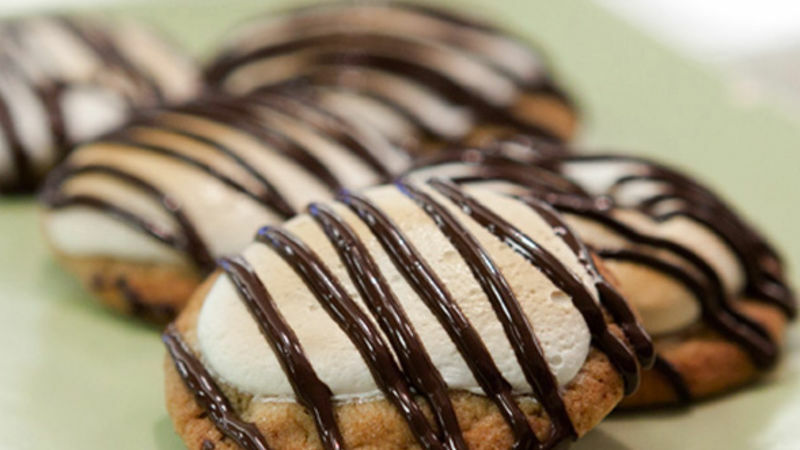 Before scooping the marshmallow fluff into the center of each cookie, dip a spoon into a small bowl of cold water. The marshmallow fluff will slide right into place. No mess involved!